Now with both audible and silent vibrating alarm options and extended battery life! Ultimate sensitivity: detects medium sized pistol from 9″ distance; large knife from 6″, razor blades and box cutters from 3″ distance, foil-wrapped drugs and tiny jewelry from 1″. Self-calibrating digital microprocessor technology eliminates the need for periodic sensitivity adjustments. Rugged, high-impact ABS case with reinforced coil compartment. Exceeds Mil-Std-810F (drop test) Method 516.5, procedures II and IV. Large 8″ scan surface for quick, thorough scanning. No tools required to change standard 9V battery (included). Sharp audible alarm and bright red LED indicates the detection of metal. 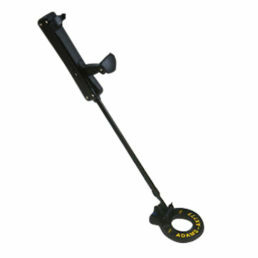 Momentary push button helps temporarily eliminate detection of nearby ambient metal such as rebar, metal walls. 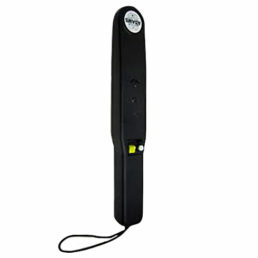 Three-color LED indication: Green LED indicates ON; Amber LED indicates LOW BATTERY: Red LED indicates ALARM. Airports; Prisons; Correctional Facilities; Public and Private Buildings; Schools; Stadiums/Concerts; Sporting Events; Nuclear Facilities; Transportation Terminals; Loss Prevention; Corporate Security; Historical Landmarks. 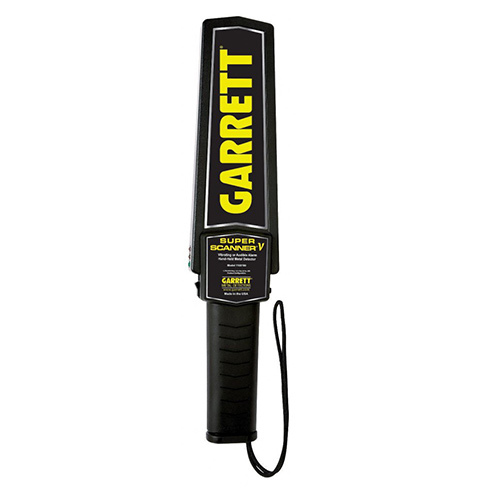 Original Garrett Super Scanner V – hand held metal detector with vibration mode.